STATUE OF LIBERTY (USA) (Bay or Brown 2000-Stud 2004). 2 wins at 2, Royal Ascot Coventry S., Gr.3. Sire of 922 rnrs, 564 wnrs, 20 SW, inc. Hay List (MVRC Manikato S., Gr.1), Mic Mac, Star Exhibit, Active Minoru, Spirits Dance, Liberty's Gem, Miss Steele, Kikuno Storm, Dan Baroness, Golden Star, Black Mambazo, Dawn Approach, Miss Liberty, Lucky Liberty, Liberty Leader, Anadolu, Broadway Harmony, Kolokol, Elysees, Tempest Tost, etc. Secretan (g. by Statue of Liberty). 3 wins. See below. Banghai (g. by Artie Schiller). 3 wins to 1200m in Aust. Qian Cheng - Mongolian Warrior (Mac.) (g. by Artie Schiller). Winner at 1200m in 2017-18 in NZ. HASSELHOOF (Tavistock). 6 wins from 1400m to 2100m, NZ$151,245, A$16,650, ARC Rich Hill Mile, Gr.2, Dunstan Feeds H., 3d Hawkes Bay Livamol Classic, Gr.1, ATC Parramatta Cup, L, Waikato RC J Swap Contractors Sprint H., L, Whangarei RC Harcourts Optimize Group H.
Esprit de Corps. Winner at 1400m, 2d Rotorua RC Van Dyk Furnishers H., BOP RC Mount RSA H., 3d Counties RC Securi-Com H., Rotorua RC BDO Rotorua H.
William Wallace. 5 wins to 1400m to 2017-18, CJC New Zealand Bloodstock Insurance H., David Emerson Accountant H., Ipswich TC Ray White Ipswich H., 2d CJC Vernon and Vazey Truck Parts H., Corin Murfitt-Thanks for 50 Years H., NZ Tax Refunds H., WRC Greenman Pub H.
Hvala. 2 wins at 1400m, 1600m, Avondale JC NZB Insurance Pearl Series H.
Maraini. 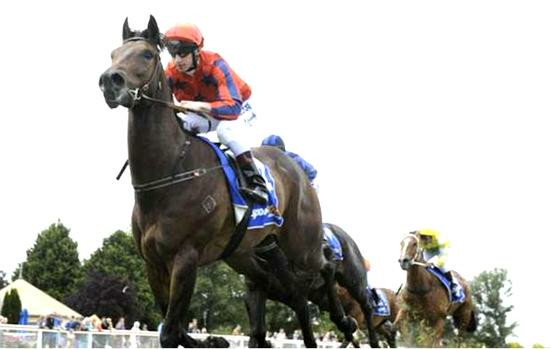 Winner at 1200m, 2d Waikato RC Christmas at the Races 17th December H.
Wonderful Approach. Winner at 1600m, Singapore TC Perak Turf Club Trophy. LORD TED (Lord Ballina). Joint Head of The 1995-96 NZ 2YO Free H. 2 wins at 2, NZ$94,000, A$70,030, ARC Ellerslie Sires' Produce S., Gr.1, Waikato RC Coca-Cola Juvenile S., 2d SAJC Adelaide Cup, Gr.1, WRC Wakefield Challenge S., Gr.3, VATC Whittier H., 4th South Australian Derby, Gr.1, WRC Magic Millions Classic S., RL. Manawa King (Zabeel). 4 wins from 1450m to 2100m, A$249,000, MRC Prince Salieri H., Beaulivre H., 2d AJC Sydney Cup, Gr.1, VRC Queen Elizabeth S., Gr.2, 3d VRC Tooheys New Deck Bar H.
Willie Command. 11 wins from 1400m to 3000m, NZ$8,063, A$241,040, VRC Sidney Myer H., Lawn H., MRC Redcraze H., Beer Street H., 2d VRC Michael Osborne Tribute H., 3d MRC Robert Taranto H., Neerim H., Waikato RC Rich Hill Stud H., 4th SAJC Carlton Draught S., Gr.3. CHAMPION STAR (Soviet Star). 11 wins from 1000m to 2100m, A$172,300, M$913,275 in Aust. and Macau, QTC Easter Cup, L, BTC Dooley's Hotel H., QTC M Ryan H., Bravery H., BTC Grant Thornton H., 2d GCTC Emirates Park H., 3d Qld Tatt's RC Recognition S., L, QTC Smartline Home Loans H., David Laing Farewell H.
Swanee Belle. 4 wins to 1400m, ARC Grey H. Producer. Race Record: 34 Starts 3-4-3 A$91,974. 3 wins at 1000m, A$91,974, 2d MRC Blue Star Group H., Bendigo JC DPR Insurance Brokers H.